Letters in the streets. She will go on watching them, upright & inevitable. Between moments, squall of air reclining, upright bolt, declining vertical. This sonnet is sheer bliss for anyone who loves the English language. Brock-Broido accomplishes vertigineous verbal acrobatics without once sacrificing intelligence or sense. Count how many of the words have at least double meanings! I’ve read this poem out loud and taken great pleasure in the way you must read the words slowly, with love and pomp. 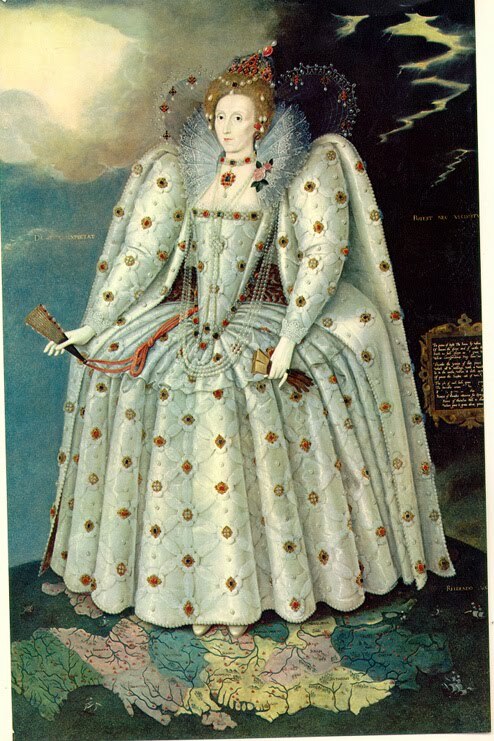 The sonnet is brocaded with “b” sounds–as brocaded as the Queen’s dress. As we make a slow and stately progress through this sonnet, we go back and revisit sounds and images. “Majusculed” marries “molecules” and “virguled” and reminds us of majesty. “Virguled” (a wonderful word here) leads us to vertical and makes us think of the Virgin Queen. I also like the “un”-ness of the poem: Elizabeth is characterized by what she is not as much as by what she is, when dying: “undrugged” “unmarrying” wearing an “unhinged” sapphire, “unwedding” England as she inevitably dies. It’s amazing–“boughs, bonfires blazing” and the “bishop’s backless chair”. This kind of language and these images are, to me, what catnip is to cats and Happy Meals to toddlers. Intoxicatingly wonderful. Nor do I find this poem an exercise in academic language–I feel for the queen, declining and dying. She is fully humanized for me here. That final breath is a precious pilgrim gone to seek another world by ending the sonnet with grace and majesty.